Spinner Takes All is a unique looking slots game, mainly because it is designed to look like a TV game show and features its own host, called Buzz Goodwin. The clever design of the game extends to an enjoyable Wheel of Fortune style bonus round that adds a lot of excitement to the overall experience. As well as some cool graphics there are also some TV show style sounds to build up the excitement while you play. The screen layout has the typical 5 reels with 30 paylines you could win on, and wagers start as little as 1p up to £5 per line, making the total wager possible £150. In terms of the symbols, you will see images that feature as the type of prize typically won on TV game shows, such as cars, holiday flights and cruise holidays. There are also the classic slots pack of card symbols for lower values, such as number and letters. Apart from the base game there is also a fabulous Prize Wheel where you can look to win some big money. This bonus feature of Spinner Takes All is triggered when you get 3 of the Prize Wheel scatter symbols on the reels. Once you have done this you then need to spin the wheel to see what prize you have won. The bonus wheel is divided up into segments with different prizes on each of them. There are also box bonus sections you can land on. If you reveal a cheque book in the box then the bonus round ends. On the other hand, the star symbol sees you get through to the next round. Of course, you will also want to see if you can scoop Buzz's Star Prize. Another useful possibility is that you will receive 5 free spins to use. 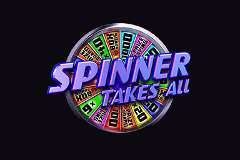 Anyone looking for a different kind of slots game should consider giving Spinner Takes All a whirl. The game show feel to it has been well executed and it all adds up to a fascinating game that has plenty of features and a number of exciting chances to grab a win.